Designed by Julie Waldman, and developed and maintained by DATA Inc., Digital Footsteps is a mobile app and re-usable framework for the travel and hospitality industry. The mobile app is designed to act as a “digital concierge” to drive traffic to local businesses and tourist attractions in the area of a hotel or other facility. 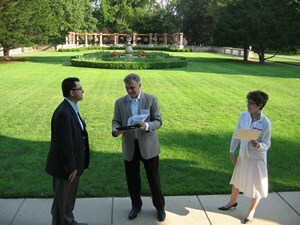 DATA Inc.’s Ashis Bhisey accepts the award for ‘Best of the World’ app from NJTC’s Rich Napoli. DATA Inc., an IT software and service provider, and Digital Footsteps, Ltc., a leading tour app provider, won “Best in the World” category at the 2013 NJTC Mobile Apps Forum and Competition.The award was presented on June 28, 2013 at Fairleigh Dickinson University in Madison, NJ, and was among 10 awards presented to notable New Jersey technology firms. The app was designed using map data from OpenStreet maps and adding DATA Inc.’s own layer data. DATA Inc. have developed a Tile Server based on a Postgres database that maintains map data at different zoom levels. For a given tour, they download a subset of map data including the company’s layered data to the mobile app. This entry was posted on Wednesday, April 2nd, 2014 at 10:31 am. You can follow any responses to this entry through the RSS 2.0 feed. You can leave a response, or trackback from your own site.